I always look forward to attending the U.S. Open each fall. I’m not a huge tennis fan, I don’t know all the top players names and at best I’m only a semi-decent player myself, but there is something about the thrill of watching incredible sports played live and the buzz of the excited crowd. The kind of people who go to watch tennis are so different than the type of people who go to see football or baseball, and the plethora of options in the food court reflect that. You’ll only see a tiny of handful of people with hot dogs and beer here, these folk tend to gravitate more towards things like grey goose cocktails and sushi. 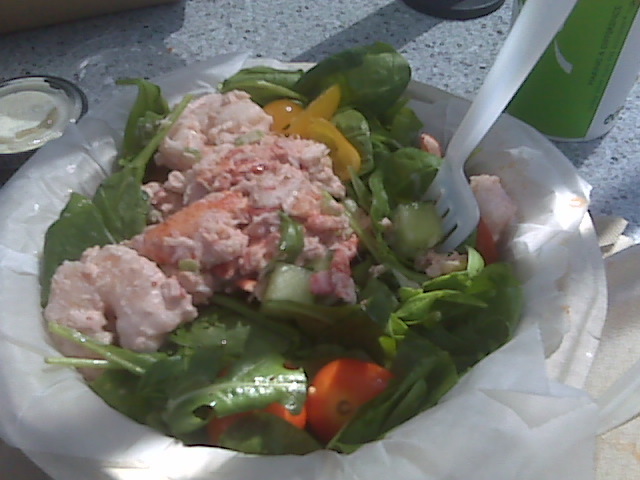 Following suit, my mother and I decided to share the lobster and shrimp salad and the salmon sandwich. Considering the generous amount of seafood in the salad, I actually thought that $18.75 was fairly reasonable for it. (The $4.50 soda was the real rip off- available in only one size which was medium-ish. If you wanted a bigger one, you had to buy the $6.50 souvenir cup which was ridiculous) The shrimp and lobster were totally delicious although there was a lot of mayo in there which neither my mom or I am a big fan of. Large pieces and cooked the right amount, the seafood was a pleasant surprise when we really expected to get just a tiny bit on top of greens. The salad was very lightly dressed with just a tiny bit of lemon juice, and it was a fantastic lunch on a hot summer day. 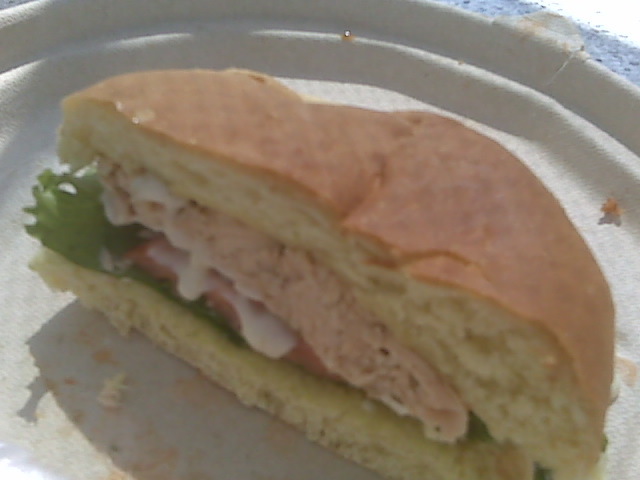 The salmon sandwich wasn’t quite as good, but it was fine- simply prepared with tarter sauce, lettuce and one really minuscule piece of under-ripe tomato. The roll was kinda crumbly and not that fresh….but still, MUCH better options than the expected hot dogs and beer. >The CIA whored us out to the US Open several years ago. A handful of us ended up walking out because of the unsanitary conditions and exhorbitant prices.